Client Trent Tano has released the e-book edition of his debut novel. 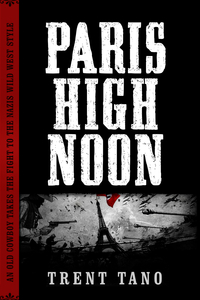 Paris High Noon takes the classic Western and sets it in World War II France. An old cowboy who used to ride with Butch Cassidy’s Wild Bunch back in the 1890s has retired to Paris in the late 1930s. When the Nazis invade, he straps on the old six gun for one last showdown. With the help of young café garcon Jean Mahleur, Catfish gathers a gang of French criminals, runaway soldiers, and men on the run to take the fight to the Nazis, Wild West style. Currently available for download at iBooks and Nook. Download your copy for your desktop or mobile today.